Originally uploaded by XO, Isabel. 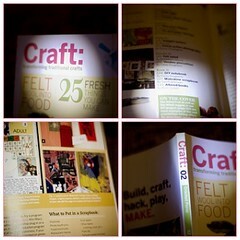 I have been included in Craft: magazine! This is their second printing of the magazine and they did a piece on Moleskine scrapbooking. The article is on page 127, and the clip of my Moleskine collage journal entry is on page 128. The original collage is here. Here's a link to my Journals photo set.